St Andrew's Church is located at 138 Nathan Road, Kowloon, Hong Kong. It is a church of the Anglican (Sheng Kung Hui) Province of Hong Kong and in the Diocese of Western Kowloon. It is the oldest English speaking Protestant church in Kowloon. 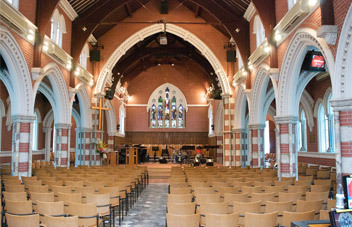 While St Andrew’s commenced its life as a church for the expatriate community, it is now an international church with 90% of those attending considering Hong Kong as their home. Sunday services are currently held at 8:30am, 9:45am, 11:30am and 5:00pm in English, and at 2:00pm in Mandarin (Putonghua). The Lord’s Supper (Holy Communion) is administered at the 8:30am service every Sunday. At all other services, it is administered on the second and fourth Sundays. 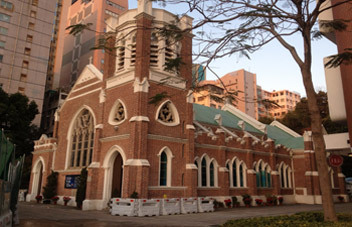 The idea of building an Anglican church in Kowloon was first suggested in 1897 but no progress was made until 1904, when Sir Catchick Paul Chater offered HK$35,000 to finance the construction. The church was designed by Alfred Bryer of Messrs. Leigh & Orange. Work began in November 1904, and was completed in 1906. The church was consecrated on 6 October 1906. The church was designed by the architects Leigh & Orange in the Victorian Gothic style. It is built of red brick and granite, laid on rammed earth foundations. The bricks on the external walls are exposed and pointed with a lime-based mortar. Interior walls are rendered with raised mortar joints and painted to represent the underlying brick pattern. The stained glass in the altar and baptismal windows is the original glass, dating from 1906, made by William Morris & Co. of Westminster, London. The church’s bell tower used to have a tall spire which eventually had to be removed due to repeated structural damage from typhoons. The bells are the original carillon of 8 bronze tubular bells from Harrington’s of Coventry, England, installed in 1906. Other heritage buildings in the church compound include the two-storey Old Vicarage built in 1909, the Amahs’ Quarters and Verger’s Cottage, built at around the same period.